"Without you, I don’t know what I would do because you make life so much easier." Former Rutgers football player Eric LeGrand is kissed by his mother Karen during ceremony where his jersey No. 52 was retired at halftime of an NCAA college football game against Eastern Michigan in Piscataway,N.J., Saturday, Sept. 14, 2013. LeGrand became paralyzed while making a tackle in an October 2010 game. 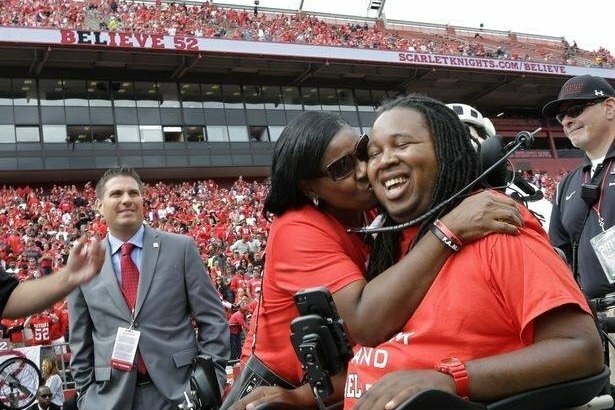 Former Rutgers University football player Eric LeGrand published a moving letter to his mom on Wednesday five years after his paralyzing spinal injury thanking her for her dedication and care. In the letter, which appeared on The Mighty, LeGrand shared several accounts of his mother’s strength and support throughout his recovery following the 2010 accident. "After my injury five years ago, you had a choice to make: Either let me figure out things on my own after being paralyzed, or take control of the entire situation and make sure I had the best of everything. You chose the second option …"
Sharing one touching account he writes,"I remember after I first got out of Kessler, when I was living in Jackson, you wanted me to hang out with my friends, so you drove an hour up north at 11 p.m., took me to the bar and went to your house 20 minutes away in Avenel. You waited until I called at 3 in the morning to pick me back up, drove an hour back down to Jackson and got me ready for bed. You really tried your best to help me adjust to our new lifestyle while also letting me enjoy myself as a young 20-year-old." Read the full post at The Mighty.